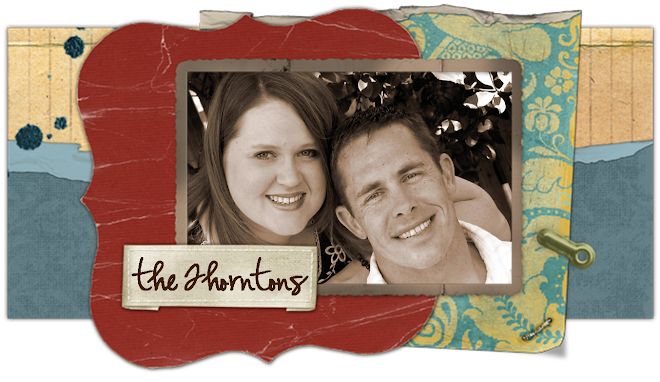 the thorntons: Tag, I'm It! 10 years ago: March 1998 was my senior year of high school. I don't remember what month Senior Musical was, but it was around this time...we did "Annie Get Your Gun" and it was SO much fun! If Molly says that the Football Banquet was that month, then I guess she'd remember better than me. I went with Zack Wristen, just as "friends". I think I was actually dating a different Zack at the time, but that's neither here nor there. OH! We went to London during Spring Break on choir tour, and that was an amazing trip. I remember bawling my eyes out through "Les Mis"...it was my first time to see it, and after the show, we were crazy fans and went to the back stage door to meet the cast. The girl playing the role of Fantine said that she remembered me crying on the 3rd row. How embarassing! Was I that loud and obvious?! Things on my to-do list today: be productive at work, eat my leftover P.F. Chang's for lunch (YUM! ), go to the bank, go to the grocery store because my husband is actually in town this week, so I'm cooking tonight! (He won't know what to do with himself!! ), get started on our taxes, practice music for a rehearsal I have tomorrow. What would I do if I suddenly became a Billionaire? Build our cabin on our lake property in Athens, buy each of my parents a new car, take Ryan to Europe, give lots to charities that I wish I could support more now...especially to the Wounded Warrior Project, host lots of fun parties, probably keep working because I wouldn't know what to do with myself if I didn't. 3. Leaving half empty water bottles all over my house and car. Drives Ryan nuts!!! 1. Church Music Adminsitrative Asst. 5. Accounting assistant at HSU. 1. I LOVE watching gymnastics...I DVR meets all the time and watch them over and over. 2. I'm actually a pretty good cook when I try. 3. My closet is organized in rainbow order...and I keep it that way ALL the time. 4. When I was little, I wanted to be a pathologist when I grew up, but considering I pass out everytime I go to the Dr., I don't know what I was thinking! 5. I've never seen the movie Ghostbusters...don't judge me. OHHH TAXES...don't remind me!! YUCK!!! Marcus was born on Easter and TAX day April 15th. Oh...Xavier leaves half-drunk water bottles all over the house too. His favorite place is his nightstand. I LOVE that you DVR gymnastics & watch it over & over...so funny! Also, I have never seen Ghostbusters either - we should form a support group! surprise! just wanted to say hello. i was checking out the Skains' blog site when I saw your name on there too. anyways, haven't heard from yall in a while and was just wondering how yall are doing. lot's going on here...we've got another kid on the way. this time it's a boy. well, i don't want to leave too long of a message here, but i have a blogspot also where i try to keep family and friends somewhat up to date. (www.numerothreelandes.blogspot.com) hope to hear from ya sometime soon. so glad you tagged Kelby ~ i knew he would be entertaining!!! !